When you’re vacationing by the northern Atlantic, you expect cold, salty surf, coastlines bristling with glossy green fir trees, shorebirds galore, and—of course—plenty of freshly caught local seafood. Here in Nova Scotia, the sea is a magnificent clear blue, the beaches are deserted and littered only by bladderwrack and long waxy strands of kelp, and the dense fir forests are carpeted with a deep cushiony layer of moss, except on the rocky seaward cliffs, where blueberries reign supreme. It’s a paradisiacal landscape, so much so that’s hard to believe it when the oldtimers shake their heads sadly in response to questions about local fishing. Time was when you just dropped a line in the bay and in half an hour you could pull out more than enough fish for dinner. Time was when you could buy your haddock, halibut or cod fresh off the boats pulled up to the dock in Riverport or LaHave. There is still a lobster industry here, but that’s about all the local seafood that’s doing well these days. At the fish counter in the supermarket down in Bridgewater, you can find a few pathetically small local haddock filets alongside farmed salmon and stiff-looking tilapia of uncertain provenance. A handful of dried-out clams and a few defrosted King crab legs completes the sad picture. Were they farmed, processed and shipped all the way from China to Nova Scotia? Or were they fished and processed on some huge Chinese trawler out on the Grand Banks, and sent over to Canadian shores from there? Either way, it’s a depressing snapshot into the dismal state of the local fishery. The Halifax Chronicle Herald ran a big front-page story the other day about the Nova Scotia provincial government’s recent $25 million subsidy of the up and coming aquaculture industry. 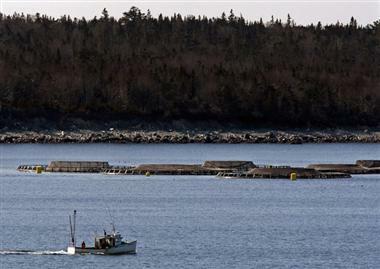 The plan is to expand salmon farming along the coast and the Digby side of the Bay of Fundy. As the article made clear, the prospect is very much a mixed bag. Yes, aquaculture will bring a few hundred fishing jobs back to these shores, and will make moderately priced fish available to consumers. But the environmental costs are potentially huge. Salmon in small pens generate a tremendous amount of waste, which leads to outbreaks of bacteria, disease and pests like sea lice—all of which must be treated with fungicides, antibiotics or pesticides that easily get out into the open ocean. The biggest local corporate salmon farmer in these parts, Cooke, admitted having to destroy several hundred thousand immature salmon just last month because of an outbreak of infectious salmon anemia. The problem with aquaculture so far is that it’s being run on the same model as terrestrial factory farms: pack in the most animals at the lowest cost to maximize profits. Never mind that the living conditions of the animals are atrocious, and they can only survive to maturity by way of heavy doses of drugs and chemical applications. It seems to me that if we are able to create trawling nets that are miles long, we ought to be able to create aquaculture cages that are also big enough to provide healthy living conditions for the fish that inhabit them. Or maybe it’s not that the cages have to be bigger, but that they have to be stocked with a lower volume of fish. Given the depleted, collapsed state of wild fish stocks, it doesn’t make sense to totally reject the idea of aquaculture. But let’s build this relatively new industry in a sustainable way, on a biodynamic model rather than an industrial one. That way it will truly be win-win all around. Great idea! We would love to see this happen. We believe the ocean is the best place to grow fish and that on-land facilities will be the true “feedlots” for farming fish; the stocking densities for these projects we have seen are up to 90 kg per cubic metre (compared to about 18 in a typical ocean farm). This raises big concerns with us about fish welfare and health. So we really like this idea of larger farms, lower densities and better sites. Let’s make ocean aquaculture the “free range” salmon farms of the future. I recommend The End of the Line:How overfishing is changing the world and what we eat, by Charles Clover, The New Press, New York 2006 (but don’t read it just before bedtimes if you’re subject to nightmares), and Sylvia Earle’s TED talk from Feb 2009 with her tag line “No Blue, No Green”, on TED.com (?maybe). 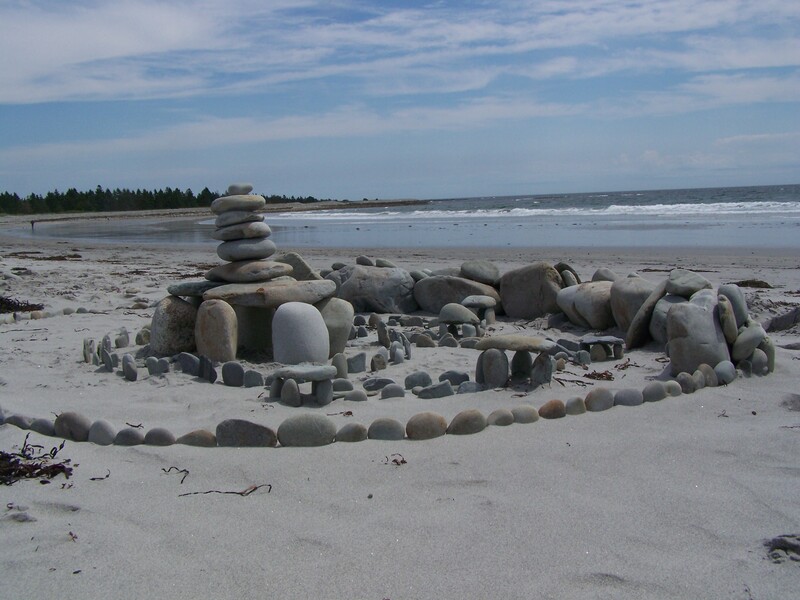 The stone sculpture is the creation of my sons, on our favorite beach here in Nova Scotia…. I love it! Have they been to Stonehenge? Even if you are in Nova Scotia (which looks amazing – is that where The Shipping News (2001) was filmed ?) – it must be very early in the morning..? Would love to have you come visit a farm. I think you will find that what you are asking for we already do. Our stocking density is very low and allows our salmon to replicate their natural schooling behaviour. Pristine seawater is essential for the production of healthy, high quality salmon, so our farmers follow strict codes & regs regarding waste management. Our industry also has a range of environmental and fish health standards that we follow to reduce any risk to our salmon, to the environment and to other species. Then there is integrated multi-trophic aquaculture – growing salmon, mussels and kelp on a single site. There’s lots to learn about how the Atlantic salmon farming industry does do it right! Yes. We need to do aquaculture in a way healthy for consumers, animals, and the environment—sustainable. Ideally, we would have enough freshly caught fish for everyone, but we don’t. As a result, the aquaculture industry has grown to satisfy consumer demand. Although fish farming is notoriously known for the overcrowding of fish (which can result in the spread of fish disease), there have been new developments to keep fish healthy. Probiotics seem to be the perfect solution; however, there is a possible drawback. Probiotics are living microorganisms, and thus, have the potential to monopolize a fish’s intestine.• The issue is analogous to the development of drug resistance strains that survive antibiotic treatment; however, probiotics deal more with the concentration of bacteria versus the absolute presence or absence of them. So, in conclusion, probiotics may solve the problem of keeping fish healthy, stopping the onset of sea lice and fungal infections—humane treatment. However, this alone will not suffice to fix all of aquaculture’s problems. Nonetheless, it is a step to creating a sustainable food. Disclaimer: The information provided is not intended to be a substitute for professional advice, whether medical, legal, or otherwise.